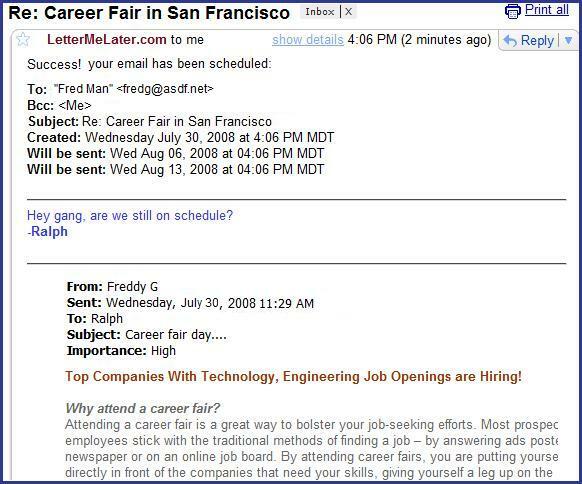 Schedule Emails - by email! You can use LetterMeLater without even having to visit this website! 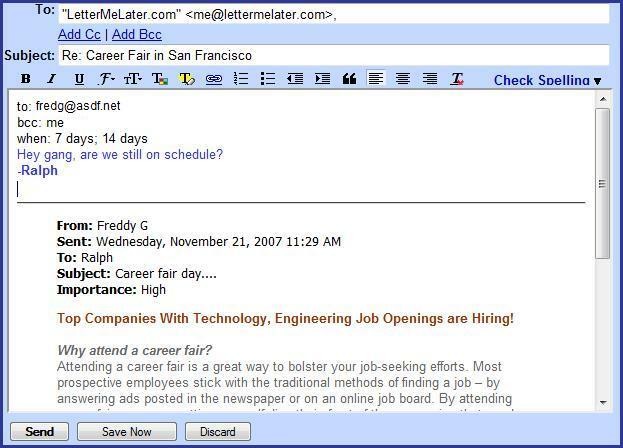 Create an email that you would like to be delivered at a later date (or dates) like you normally would. It can even be reply or a forward. You will immediately receive a response, indicating whether is was done successfully or not. If it was, you will be able to see the email in your LetterMeLater account. The date format is flexible! You can either enter a time relative to the current time, or an absolute time. A complete description of valid dates is listed under the GNU format. Recipients can either be email addresses, or groups names. Each entry must be separated by a comma(,) or a semi-colon(;). You will need to do it this way if your email client has word-wrap, and your lines are long enough to get wrapped. If your email program won't allow you to edit the HTML source of your emails, you can do it here! If you send an email in plain text with html code in it, use the option: html and your email will be delivered as html to your recipients. Otherwise the format of your emails will be automatically detected, and therefore the format does not need to be specified. Email messages are not always instantaneous! It usually takes only seconds, but could take minutes or even hours. Be patient.